Can Margaret keep the guys in line in the first season of The Cool Kids TV show on FOX? As we know, the Nielsen ratings typically play a big role in determining whether a TV show like The Cool Kids is cancelled or renewed for season two. Unfortunately, most of us do not live in Nielsen households. Because of that, many viewers are frustrated their viewing habits and opinions aren’t considered before a show is cancelled or renewed. So, we invite you to rate all of the season one episodes of The Cool Kids below. What do you think? Which season one episodes of The Cool Kids TV series do you rate as wonderful, terrible, or somewhere between? Should FOX cancel or renew The Cool Kids for a second season? Don’t forget to vote, and share your thoughts, below. More about: The Cool Kids, The Cool Kids: canceled or renewed? This show is hilarious and Sid is so funny. The whole cast is awesome. My son comes over just to catch up on his shows and this is one of his favorites as is mine. Please please renew!!!! this is one of the stupidest shows on TV it’s not funny at all. 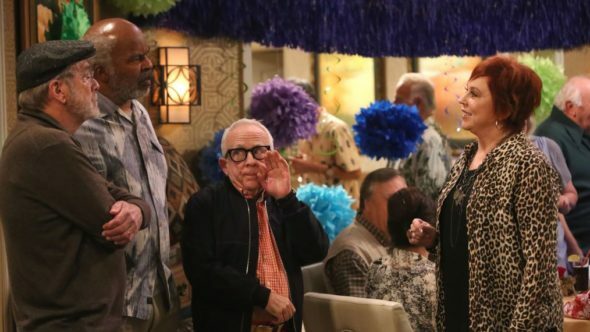 Maybe they can save the show if they get rid of Leslie Jordan, he’s to over the top not funny at all. can’t someone come up with something better that this show?